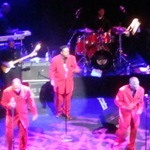 The Stylistics in concert was to prove a major emotional test. The London date coincided with my late mother’s birthday and when I was a baby, one of their songs had to be played repeatedly for me to fall asleep. Arriving early, we had time to visit the British Music Experience Museum. There is no doubt you can have loads of fun in there, especially with the musical instruments, the singing and the dancing. However, the idea to attempt to dance to Madonna’s ‘Vogue’ was a massive miscalculation. Seconds into the routine, it was obvious this dance was impossible. So it made sense to have another go, this time choosing ‘One Step Beyond’ by Madness. This routine was far easier and probably just as hilarious to do. With time flying by, we headed off to the O2 Indigo and of course the VIP bar upstairs with those tasty Mojitos. Finally managed to leave the bar for the arrival of The Stylistics on stage. With so many hit tunes behind them, they were just rolling them out. The Stylistics had the audience singing and dancing to Can’t Give You Anything (But My Love); I’m Stone In Love With You; Peek-A-Boo; Stop, Look, Listen (To Your Heart); Betcha By Golly, Wow; Na Na Is The Saddest Word; Break Up To Make Up; You Are Everything; and one of my favourites and best known, You Make Me Feel Brand New. Considering The Stylistics are no longer touring with the original line-up, the band is definitely a joy to watch and listen to. Once again, it was another fantastic night. In a way, it was probably a good thing they didn’t sing ‘Let’s Put It All Together’ as I probably would have found it all a bit too much. Best left to the memory ‘as the tune that put me to sleep as a baby’.